ROME - Italy is caught in a "Culture Crunch": that is, the gulf between the country's splendid cultural heritage - its art, architecture, archaeology, cityscape, landscape - and the terrible problems in caring and maintaining such an abundance of riches. Making a gesture in the right direction, Massimo Bray, Minister of Culture and Tourism, has just appointed a "Commission for the Revision of the Code for the Cultural Heritage and Landscape," whose goal will be to harmonize the legal norms regarding the care and feeding of the heritage, and the programs of the various institutions charged with putting these norms into action. Sounds fuzzy? Minimal? Perhaps, but the commission members are as good as it gets, so there is hope. Commission head is the severe and admired archaeologist Salvatore Settis, whose accepting the appointment is all the more meaningful because a few years back he resigned in protest as head of that ministry's general oversight commission. Members of this new body, which admittedly has limited powers, are equally distinguished: former Premier Giuliano Amato; Paolo Carpentiere, head of the ministry's legal office; Molise Region cultural heritage director-general Gino Famiglietti; and Maria Luisa Maddalena, a magistrate. All are donating their skills and time without pay. But meantime another project dear to Minister Bray's heart, and which he proposed in Parliament, has been put on hold because too complicated and controversial. Bray's proposal is to turn over to private interests some of the myriad minor archaeological and other heritage sites that are currently padlocked for lack of personnel. These shuttered sites, as Bray told Parliament, represent a "very serious phenomenon" which "impoverishes" the state and harms the economy since the sites could become money-earners. On the pragmatic level, objections to Bray's plan abound. One is that non-profit entities have no legal status in Italy. Veteran journalist Vittorio Emiliani's lapidary sentence is that to put private citizens in charge of the cultural heritage would be "to put the fox in with the chickens." For his part, Professor Settis argues that the project flies in the face of Italian law which has, for well over a century, made all heritage sites the automatic, common property of the Italian people (that is, of the state). It was already considered a radical and scary innovation when public museums were allowed to open book and gift shops back in 1993 under the ministry of Alberto Ronchey. Settis believes that to turn over management of Italian heritage sites to private businessmen "would be profoundly wrong" because the state would be abdicating its Constitutional role. "We must free ourselves of the equivocal notion that the arrival of private citizens can compensate for the lacks of a state which, since 2008, began a devastating withdrawal from the cultural arena." Nevertheless, the long list of problem areas argues that something must be done, and as quickly as possible. Consider these disturbing areas where action is urgent: . Money for Ministry projects has been cut in half in 13 years, from the 0.39% of the year 2000 to this year's 0.20%. With some 2,000 archeological sites, the number of archaeologists in the employ of the state has dropped to 343. Only 453 art historians are in the employ of over 460 state museums. On the bright side, Minister Bray promises that 500 young people will be taken on as Ministry interns. The historical center of L'Aquila in the heart of the Abruzzo remains the country's largest single completely unresolved restoration project. Little in the town center has been changed since 2009, when the city with its great monuments dating from the Middle Ages was devastated by an earthquake. 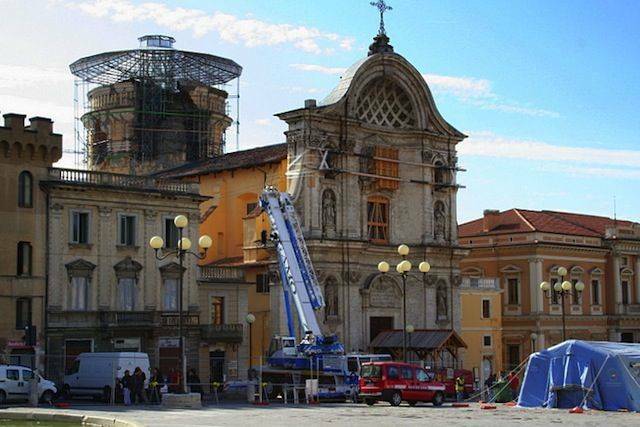 This month Mayor Massimo Cialente ordered the closing of the historic Basilica of Santa Maria di Collemaggio, which it had been partially reopened for worship, after weaknesses were found in its walls. ENI will finance restructuration with a grant of E12 million ($15 million). The problems of the ancient site of Pompeii are already well known, but, as this frequent visitor there can testify, it is terrible to see, on the one hand, overcrowding and, on the other, so many buildings that have become off-limits to the public. Reorganization is in the works, fortunately, and none too soon; Pompeii administration requires enormous professionalism and adequate staffing. It is simply not enough to be a dedicated archaeologist, as Bray has acknowledged. The big ships in overcrowded Venice bring thousands of visitors at a time into the fragile, historic port areas and hustle them down narrow streets. To say that most see little is understatement. Ordinary visitors themselves run risks from congestion in the lagoons, like the German tourist of 50 who was killed when a ferryboat crashed into the gondola in which he and his family were riding near the Rialto Bridge. These are only the most obvious problems. Cinema production, grand opera, symphonic orchestras are all hurting in what is, to quote Vittorio Emiliani, "cultural suicide." In a future column the gladiatorial battle over Colosseum sponsorship will take center arena.